A research team from Stanford University’s School of Medicine has recently concluded the enrollment of a large-scale clinical trial in which the Apple Watch was used to establish if a wearable technology can detect atrial fibrillation. The design of this exclusive clinical study—the first-ever largest screening study performed on atrial fibrillation—has been elucidated in the study rationale and design published by the American Heart Journal. More than 400,000 participants were enrolled in the study and its results will give the initial evidence of the ability of the smartwatch to detect pulse irregularity that may be reliable with formerly unknown atrial flutter, or atrial fibrillation (jointly referred to as AF). “The advantage of the app that uses the optical sensor is that it can check for an irregular pulse multiple times throughout the day in the background, without needing the user to actively engage the application,” stated Marco Perez, one of the principal investigators of the study and Assistant Professor of Cardiovascular Medicine at Stanford. Since health-centric devices are in huge demand, using smartwatches, smartphones, and other types of “wearables” has become a routine experience for the majority of Americans; in fact, smartphones are owned by more than 75% of the U.S. population. A smartwatch’s ability to possibly detect an arrhythmia—a medical condition in which the heart beats too fast, too slowly, or in an abnormal manner, is of major public health interest: approximately three to six million people in the U.S. suffer from atrial fibrillation; if this condition is not diagnosed or treated, it can cause heart failure or other serious complications, such as stroke. Furthermore, 700,000 people in the U.S. are estimated to have previously unknown atrial fibrillation. 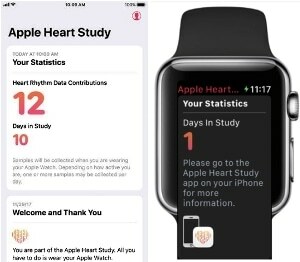 The objective of the Apple Heart Study is to infer whether wearable technology can indeed detect irregular heart rhythms that indicate atrial fibrillation by examining the pulse-rate data from the optical sensor provided on the Apple Watch. In order to establish the pulse reading, the smartwatch employs light-sensitive photodiodes and LED lights to determine the variations in the amount of blood flow passing via the user’s wrist to produce a photoplethysmogram, which is used to assess the pulse. Then, using the intervals, a tachogram (pulse rate over time) is produced, which can be used to determine the irregularity in pulse that may indicate atrial fibrillation. If atrial fibrillation is suspected, a notification system on the Apple Heart app and Apple Watch alerts the study participants. Post an irregular pulse notification, participants move on to telehealth video visits with a study physician—all through the app—and get an ECG monitoring patch to be worn which verifies the diagnosis of atrial fibrillation. In case there are urgent symptoms, like shortness of breath or chest pain, study participants were allowed to go to their local emergency room or urgent care facility for medical assessment. Through the nation-wide implementation of this study, participants have access to medical attention if required, aiding to ensure the safety of participants. “We now have access to high-quality sensors that can measure and detect changes in our bodies in entirely new and insightful ways without even needing to go to the doctor, but we need to rigorously evaluate them,” stated Mintu Turakhia, the other principal investigator of the study and Associate Professor of Cardiovascular Medicine at Stanford. The study will establish how many study participants receiving irregular pulse notifications have atrial fibrillation, and will also establish how many among those who received an irregular pulse notification continue to get medical attention. It will even determine the precision of irregular pulse-detection on the smartwatch. The clinical trial has entered the last phase of data collection and will be over early next year.